Public speaking is such a hot topic hundreds of books have been written on it, so why would you want to buy this one? "Gavin has made this subject both interesting and engaging. His ability to give relevant examples and case studies means the reader is able to follow and implement his advice. Plus links and QRCodes to further reading expands the offering further. 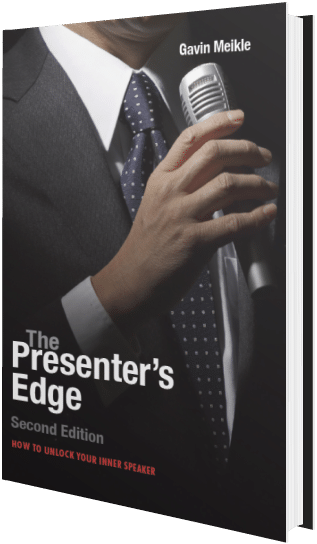 To celebrate the release of The Presenter's Edge, I am offering a valuable bonus for everyone who buys a copy (print or kindle). Simply click on one of the buttons above to buy the book, then return to this page and complete the form below! Claiming your bonuses is easy! Buy your copy, in either format, from Amazon. Enter your details, then copy and paste your receipt/order number into the message area the right. I'll send you an email with details of how to access your bonuses! Gavin Meikle has been helping people develop, design and deliver persuasive presentations for twenty years. He is an entertaining and enthusiastic speaker, who has spoken around the world to audiences as small as two and as large as four thousand. He has been blogging about presentation skills for almost ten years, and his popular blog is recommended reading in many educational establishments around the globe. A Scot, Gavin was born in Dundee and grew up in Arbroath just up the coast where his passion for public speaking, was first ignited at Arbroath High School. " "I was quite shy as a child but was persuaded by one of my English teachers, Colin MacIntosh, to join the school's debating society. It was hard work at first but began to enjoy the challenge of researching a topic and then building a case that would persuade others." Gavin attended the University of Dundee where he studied Chemistry. Upon graduation, he embarked upon a marketing career and then switched to sales. "I never thought of myself as a salesperson, but I found that I had a flair for it and it was during that period that I became fascinated by the psychology of communication. It seemed to me that too many people took communication for granted, often with disastrous results!" After almost 20 years in sales, sales training and sales management, Gavin decided to set up his own communication and influencing skills consultancy in 1997 and so Inter-Activ Presenting and Influencing was born. Gavin is as passionate about his own learning and self-development as he is for that of his clients. He has undertaken numerous training courses and holds qualifications in Adult learning, Neuro-Linguistic Programming (NLP), Coaching. He is also an active member of Solent Speakers Club, his local Toastmasters International public speaking club Solent Speakers, and has won multiple contests and awards for his speaking and evaluation skills. 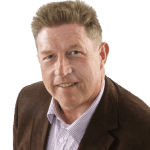 Gavin lives in Portsmouth with his wife Lyn and continues to teach and write on the topics of communication, presentation skills and influencing skills. "Gavin's book is concise and can be easily read in a couple of hours, yet it is packed with essential information for any speaker. Even for seasoned speakers, there are useful reminders of the key points, which make all the difference to the impact of a presentation. As with all great books, the information only works if you apply it. I have seen Gavin present and can tell you he definitely 'walks his talk'. If you apply even one or two of the great suggestions he describes in his book, I can guarantee your improvement." "Easy to read and easy to apply. Gavin has made this subject both interesting and engaging. His ability to give relevant examples and case studies means the reader can follow and implement his advice. Plus links and QRCodes to further reading expands the offering further. I used the knowledge in the book to review a presentation I had already prepared, by tweaking it using Gavin's tips made it much easier and more natural to deliver. Plus the results from the feedback were brilliant. Thank you, Gavin. I look forward to further 'bite-sized books' to enhance my presentation skills further." "There seem to be a lot of poor presenters in the world who have, perhaps, had no training in how to put across their message. This short book is excellent and covers a lot of material in a clear, succinct and practical way. Just about everyone has to present something to someone sometime so please read this book and you will learn how to do that in a more effective and confident manner. Go ahead and buy this book. The cost is very low compared to the benefit you will get out of it. Five stars !" Content is the first pillar of effective public speaking and relates to the messages, ideas and information that are shared with your audience. Whether your purpose is to entertain, inform or educate or persuade, the clarity and relevance of your speech content are crucial. If your messages don't resonate with your audience they will switch off, and if your arguments don't make sense then they won't be persuaded. The Presenter's Edge includes a practical, step by step strategy for setting a clear outcome and then choosing the right blend of ideas, information and examples to achieve it. Gavin's backwards planning model will help you to choose the best blend of material to achieve your outcome with maximum impact and efficiency. Of course, information on its own is seldom enough. If that information isn't structured properly and delivered in an engaging and credible manner, all the work that you put into creating that content will have been wasted. Structure is the second pillar of a persuasive presentation and relates to the organisation and sequencing of your content for maximum impact and influence. A poorly organised and apparently irrelevant presentation is hard to follow and so your audience is much more likely to"switch off." The Presenter's Edge clearly outlines a proven structure that will ensure that you engage your audience quickly and hold their attention as you make your case. Delivery is the final pillar essential for a compelling presentation, and it relates to the way you communicate your messages to your audience. In my experience, inexperienced speakers give little or no thought to their delivery, probably because they underestimate its importance. Sadly, poor delivery will undermine even the most compelling content. so please don't neglect this area of your preparation.